​Once you have completed secondary education and aspire for a university education, you are faced with many ‘Pre-university’ options. These are also sometimes known as Year 12, or bridging programmes or preparatory programmes. The graphics below capture most of the popular options available in Malaysia. 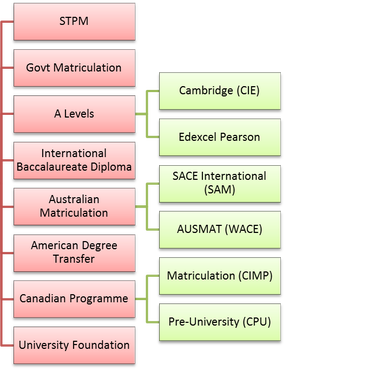 The STPM (Sijil Tinggi Pelajaran Malaysia) and the Local Matriculation pathways are primarily government or non-private options and are not included below. Find out more about the STPM here and the Government Matriculation Programmes here. In Malaysia, international schools offering the A Levels programme may offer students a choice of subjects and also a choice of exam boards: Cambridge International Examinations (CIE) and Pearson Edexcel. Both boards offer qualifications that are internationally recognised and accepted by colleges and universities around the world. Exam boards are organisations that offer qualifications to students and it is their job to produce exam papers, mark your work and award your grade. To find out more about each board and help you decide whether to do the CIE or Edexcel exam, see the links below. Curriculum and recognition: The A levels is recognised worldwide and thousands of learners gain places at leading universities every year with the A level qualification. The syllabuses develop a deep understanding of subjects and independent thinking skills. Most students study three to four A level subjects, but institutions will provide guidance on this to help students get into the university and course of their choice. Age and Duration: Although aimed at 16 – 19 year olds, they can be taken at any age, provided you have completed your GCSEs or SPM or equivalent. A Level programmes offered in Malaysia typically run between 15 to 24 months. They are made up of 2 parts: 1) AS (Advanced Subsidiary) and 2) A2. Assessment: Assessments are exam-based. Previously, AS marks contributed towards the final A Level grades, but under the 2015 reforms, AS marks no longer have any impact on the final A-level grade. Instead, this final grade is decided by exams taken at the end of the A2 year. Nevertheless, the AS Level gives learners valuable feedback on their performance, identifying strengths and weaknesses before they complete the A2 stage. Grading: Each subject that a learner takes receives a separate grade. Grades are benchmarked using internationally recognised grades, which have clear guidelines to explain the standards of achievement. The A Level is reported on a grade scale from A* (highest) to E (minimum required performance). Recognition: Although the International Baccalaureate (IB) is not as well-known as the A Levels, as of 22 May 2015, there were 2,795 schools offering the Diploma Programme (DP) in 143 different countries worldwide. Age and Duration: The International Baccalaureate® (IB) Diploma Programme (DP) is for students aged 16-19, and typically runs for 2 years. Curriculum: The programme aims to develop students who have excellent breadth and depth of knowledge – students who flourish physically, intellectually, emotionally and ethically. To encourage breadth and depth, IB DP offers subjects at the Standard Level (SL) so students are exposed to a range of disciplines and also subjects at the Higher Level (HL) so students can explore specific areas of personal interest in greater depth. SL courses are recommended to have at least 150 hours of instructional time, and HL courses are recommended to have at least 240 instructional hours. It must be noted that the assessment criteria are equally demanding for both levels, and SL exams are marked and standardized with the same rigour as all IB coursework. Assessment: IB DP uses both external (exams) and internal assessment (teacher assessment of fieldwork, laboratory work, artistic performances, etc. ). In addition, the DP core can collectively contribute up to 3 additional points towards the overall Diploma score. Grading: Student results are determined by performance against set standards, not by each student's position in the overall rank order. In the DP, students receive grades ranging from 7 to 1, with 7 being highest. Students receive a grade for each DP course attempted. A student’s final Diploma result score is made up of the combined scores for each subject. The diploma is awarded to students who gain at least 24 points, subject to certain minimum levels of performance including successful completion of the three essential elements of the DP core. Recognition: The WACE or Western Australia Certificate of Education is commonly known as AUSMAT in Malaysia and as the name suggests, is offered by the School Curriculum and Standards Authority (SCSA) of Western Australia. It is a world recognised pre-university program that provides a seamless transition into universities across Australia and around the world, including Ivy League universities in the United States of America and the United Kingdom. AUSMAT opens pathways to a wide range of career opportunities. The one-year AUSMAT program is the same as the Year 12 program offered in Western Australia. Successful students receive the Western Australian Certificate of Education (WACE), issued by the School Curriculum and Standards Authority (the Authority), on behalf of the Western Australian Government. Age and Duration: Aimed at students aged 16-19, AUSMAT is delivered in 10 – 18 months in Malaysia, depending on when you embark on the programme. Curriculum: The AUSMAT program is dynamic, relevant, balanced and academically challenging. AUSMAT prepares students for a variety of career paths, including medicine, dentistry, finance, business, information technology, science, law, engineering and the arts. Students develop communication skills, self-discipline, and respect for themselves, their peers and the world. As well as a well-rounded curriculum, students develop skills in teamwork, self-expression and personal development. Students are usually required to select five AUSMAT courses with at least one from List A which comprises courses in the field of Arts, Languages and Social Sciences (like Business Management, ESL, Economics etc.) and one from List B which are courses in the area of Mathematics, Science and Technology (e.g. Mathematics, Psychology Accounting and Finance etc.) . Students must also complete two units of an English course and obtain at least one C grade in English. Assessment: Assessment comprises 50% school assessments and 50% external examinations. In school assessments, lecturers develop tasks that meet the requirements of the course syllabus. 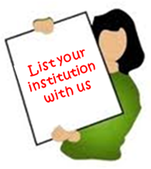 Tasks may include assignments, laboratory work, quizzes, tests and projects. There is, in addition, an external examination for each course. Examinations are conducted every November. Independent markers mark the examination papers. They are the same markers who assess the exam papers of Western Australian students. Grading: For students seeking university entrance, an Australian Tertiary Admission Rank (ATAR) is calculated using the best four course results. The ATAR score reports your rank position relative to all other students. (For e.g., an ATAR score of 90.0 means that you performed better than 90% of your peers). The ATAR is used by university admission centres around the world to process applications for admission to most undergraduate courses. ​Recognition: SACE International, commonly known as SAM in Malaysia, is an internationally recognised pre-university program administered by the SACE (the South Australian Certificate of Education) Board of South Australia. SAM programmes offered by institutions in Malaysia are equivalent to the Year 12 South Australian high school course. They provide an opportunity for students to study in their own country and is the most popular Australian-based pre-university program in Malaysia, where it has been taught since 1982. The SAM qualification has led students to be accepted by universities across the world, including in Australia, the United States of America, the United Kingdom, Canada, and New Zealand. Curriculum: A variety of subjects are offered, and these can vary by institution. To qualify for the SACE and to meet Australian Tertiary Admission Rank (ATAR) requirements, students must complete 90–100 credits from the subjects offered by the institution. These may include: English as Second Language Studies, Accounting, Biology, Chemistry, Economics, Information Technology, Legal Studies, Mathematical Studies, Nutrition, Physics, Psychology, Research Project, and Specialist Mathematics . Assessment: The subjects in SAM are assessed by a combination of external (70%) and school assessment (30%). School assessments are moderated and undergo a number of quality assurance checks. The school assessments enable students to develop the independent learning and study skills necessary for successful university study. External assessments, including examinations, are developed by panels under the SACE Board. Students' completed examination scripts are sent to Australia to be marked in the same pool as those of all students from South Australia and the Northern Territory. Grading: Students who successfully complete SAM are accredited with the South Australian Certificate of Education (SACE), an award that is recognised within the Australian Qualifications Framework (AQF). Students are provided with a university aggregate score (out of 90) and an Australian Tertiary Admission Rank (ATAR). The ATAR score reports your rank position relative to all other students. (For e.g., an ATAR score of 90.0 means that you performed better than 90% of your peers). The ATAR is used by university admission centres around the world to process applications for admission to most undergraduate courses. They are offered in different institutions but are essentially the same, leading to an internationally recognised Ontario Secondary School Diploma (OSSD). Recognition: The Qualification has been used to gain entry to worldwide tertiary education with students attending universities in Canada, Australia, New Zealand, UK, USA, India, Singapore and Malaysia, to name a few. Age and Duration: Typically taken by 16-19 year olds, the programme is 12 – 15 months long. Curriculum: In Malaysia, the programme is generally taught primarily by Canadian or Canadian-qualified teachers. The programme encourages an interactive learning style and helps versatile students to shine with a broad-based curriculum that is both dynamic and creative where students are required to take 6 subjects. These subjects can come from various fields like English, Business Studies, Computer Studies, Mathematics and Science. Assessment: The assessment consists of both ongoing course work (70%) as well as a final evaluation (30%). For coursework, students will be awarded a grade that will reflect the student’s most consistent level of achievement throughout the course, although special consideration will be given to more recent evidence of achievement. As for the final evaluation, it will be administered at or towards the end of the course. This evaluation will be based on evidence from an examination, a performance, an essay, and/or another method of evaluation suitable to the course content. The final evaluation allows the student an opportunity to demonstrate comprehensive achievement of the overall expectations for the course. Pass at least six university preparation courses, depending upon their entry equivalency assessment totaling 30 OSSD credits. ​An American Degree Transfer Program (ADTP) is a preparatory course designed to provide students with the academic knowledge, skills, and confidence to join and successfully complete a bachelor’s degree, usually at a US or Canadian university. Recognition: As the title of the programme suggests, the mechanism in the ADTP is the transfer of credits. There could be some uncertainty about which credits will successfully transfer and to which US universities, given that each US university decides whether or not ADTP credits are transferrable and, if so, which ones. This means that the number of US universities one can transfer to from ADTPs is limited. But the private institutions in Malaysia offering ADTP can guide you, and the more established ones may have a good track record of successfully transferring students to their university of choice. Duration: Students can enrol in the ADTP directly after SPM, and in total, the programme will take at least 4 years. It can take the form of 2+2 which means students study 2 years in Malaysia and then transfer to a US university for another 2 years. It can also take the form of 1 + 3 structure, which means after a year in Malaysia, students transfer to a US university to study for another 3 years to obtain a Bachelor’s degree, making it a total of 4 years to a first degree. Curriculum: Students are exposed to a broad range of academic subjects outside of their core discipline. During Year 1 and 2, students take core courses in their major and courses satisfying the General Education requirements including English, Mathematics, Natural Sciences, Humanities, Social Sciences and Fine Arts. The broad-based, flexible curriculum allows students to decide on or switch their major even in their 3rd year. This is a feature of American undergraduate education – the flexibility to take courses in a wide range of subjects before narrowing in on one’s major. Students will typically take about 3 – 4 subjects per semester, and each subject is worth a number of credits or credit hours. Assessment: As education is learning-driven instead of exam-driven, continuous learning and testing is common. Through various combinations of coursework and examinations, students are encouraged to be strong in critical thinking and communication skills. Grading: American universities typically assign students a GPA (grade point average) and CGPA (Cumulative Grade Point Average). In terms of grading, subjects are assigned a grade from A – F, and can include A- and so on. Each grade is assigned a number of grade points. An A grade receives 4 points, a B=3, a C=2, a D=1, and an F=0. Without getting into details, in general, a grade point average is a number representing the average value of the accumulated final grades earned in courses over time. GPAs may be calculated at the end of a course, semester, or grade level, and a “cumulative GPA” represents an average of all final grades individual students earned from the time they first enrolled in a school to the completion of their education. Many universities in Malaysia offer a Foundation Programme, which a tailored pathway to the institution’s undergraduate offerings. Duration: It is typically a one-year programme, and can run over two or three semesters. Recognition: Foundation Programmes are focused and tailored to seamlessly lead to the university’s own undergraduate set of programmes. This also means that students who wish to use the Foundation results to gain admission to another university may find that recognition is not a given, and is often given on a case to case basis. In other words, it is up to the “receiving” university to determine whether to accept a student’s Foundation certificate from another university. Curriculum: What differentiates Foundation Programmes from other pre-university options is that the curriculum, learning material and assessments are put together by individual universities and not by a central Exam Board. Hence there is no standard or centralised structure or system or set of subjects. Universities offer specific pathways, and so a Foundation in Science would offer subjects in Physics, Chemistry, Biology, Mathematics, Computing, Engineering and usually Academic English / Study Skills. Similarly, a Foundation in Business would consist of subjects in Business Management, Accounting, Finance, Economics, Business Mathematics or Statistics and an Academic English / Skills stream. Although Foundation programmes may offer core subjects and electives, it is common for students to select subjects directly relevant to the undergraduate programme they are planning to undertake. This is the advantage of Foundation programmes: it is designed to best prepare students and aid their transition into the university’s undergraduate degrees. Assessment and Grading: Assessments are administered by the university itself and hence varies widely across institutions. Students are typically assessed through a combination of coursework which is their ongoing achievement, and a final examination. The weightage of each varies across universities and programmes. Universities would also have their own grading system.